Hilarious look at novel-writing that covers everything from authors who transplant 21st century attitudes to historical novels (who knew the Vikings could also be feminists?) to evil characters who are evil, not because of what they do but because of who they are ("Burt was an evil used car salesman... but I repeat myself") to characters who know each other 30 seconds and start telling each other wildly inappropriate information ("Well, you know I would drink but I'm a total teetotaler because of my father's alcoholism." "That's nothing. My mother gave atom bomb secrets to the Soviet Union and was executed for it.") 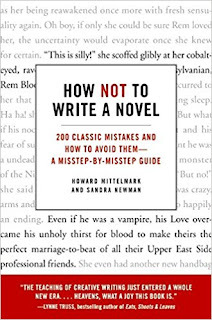 this book is a fun read even if you DON'T plan to write that novel!